The calendar dashboard is your central location for all your Teamup calendars. With a calendar dashboard, you don’t have to bookmark separate calendar links. Your dashboard remembers all your calendars for you and is accessible from any browser. Log in from anywhere, view your dashboard, and click to open the calendar you need to see. The Teamup account dashboard keeps all your calendars in one place. 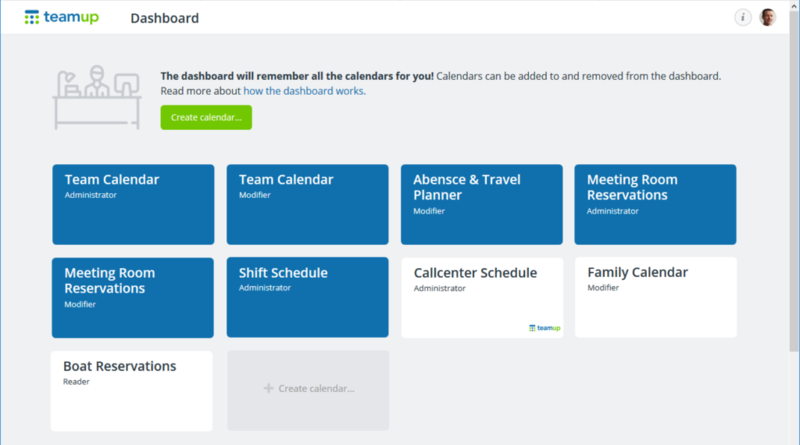 To use the calendar dashboard, you need to log into your Teamup user account. If you don’t have a user account yet, create one here. It’s free for anyone. If you haven’t accessed your Teamup calendars while logged into your user account, you may not have added them to your dashboard yet. It’s easy to add calendars to your dashboard. Make sure you are logged into your user account. Then open your calendar. Look for the green + button at the top of the calendar. Click the button to add the calendar to your calendar dashboard. « What are user accounts?